DDA partners with SWFP to support women working for peace in Syria. The Syrian Women's Forum for Peace aims to activate Syrian and international public opinion to lobby decision makers to adopt peaceful political means to build a democratic state. We advocate for peaceful transition, against violence, and we want to have more involvement of women. We think this transition should be inclusive so that we can have peace. Otherwise people will continue to fight. 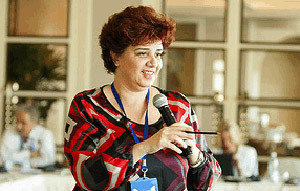 In October 2012, more than forty Syrian women from all walks of social and political life came together in Cairo at a working seminar, convened by Karama and supported in part by Donor Direct Action, to forge a united vision and share efforts to advocate for and reinforce a greater role for Syrian women in all sectors of public affairs. Women’s role in decision-making and peacemaking and women’s security in the context of ongoing conflict and violence were emphasized as priorities within this framework. The seminar concluded with the formal launch of the Syrian Women’s Forum for Peace. • Focus on the importance of the participation of people of all walks of life in peace-building and national reconciliation on the basis of citizenship. • Focus on the reality of women in all sectors of society, and not only educated or elite women, and reverse the suffering of displaced and marginalized Syrians and Syrian refugees. • Take advantage of the experience of skilled women from across the globe in the process of peace making, and to create a task force of Syrian women tasked with nation-building together. • Focus on the importance of networking in building the widest possible coalition in Syria striving for peace. • Work to adopt effective communication strategies and be able to establish within the local Syrian communities the concept of civil peace in Syria, and build this concept from the ground up. The Syrian Women’s Forum works on communication, networking, training, and empowerment of local communities – and highlights the need for efforts to find a peaceful way to achieve democracy in Syria. The Syrian Women’s Forum for Peace operates under the umbrella of Karama, an organization founded in 2005 and headquartered in Cairo, where it is forging a regional movement to fight for women’s rights, strengthen support services against violence, and build awareness. Karama’s mission includes developing a culture of collaboration, as well as raising the profile and expanding the influence of Arab women as leaders, both regionally and internationally. Learn more about Karama. As mothers, as lovers of peace, and as Syrian women who want an end to war, we sign with tears in our eyes in order to stop this horrific violence against innocent people within Syria.